Welcome to NBA Draft Week: Teams will select players — mostly junior high school students — in the NBA draft this week, allowing youngsters to flush a free college education down the toilet for a shot at a few million bucks. 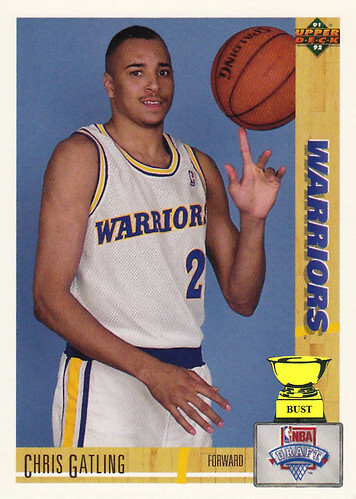 To celebrate such an admirable event, The Bust is bringing you a week of the best basketball cards, mostly found in a brown paper bag in our older brother's closet. Golden State Warriors' scouting report on Chris Gatling: "With arms resembling those of a seventh-grade girl, we may need to stress a weight room regimen. ... If his fingers were an inch or 2 longer, he wouldn't have to jump to dunk. ... He was nicknamed 'Gat Gun' last year. Since then, only spins ball on index finger; no longer shoots or dribbles. ... We are the Warriors. His hero is the Ultimate Warrior. Ideal match. ... We'll need to talk to him about his penchant for hanging around Sears photo studios instead of basketball gyms."